This is Paraskevi Tsardoulias (Παρασκευή Τσαρδουλιας). She is my 1st cousin 2x removed. I knew from family research that she was born on the island of Samos, Greece in 1925. I have come to learn just recently that she was born in the town of Mytilinioi on Samos. Paraskevi's father, Stelios Tsardoulias (born in 1895) was the younger brother of my great grandmother, Maria Chardoulias Halvangis (1894-1951). Stelios and Maria were two of eight Tsardoulias siblings who all had the same father, Antonios Tsardoulias, born around 1855 presumably in Samos. Antonios had four children with is first wife and four with his second. Stelios and Maria are full siblings. I received this photo from another 1st cousin 2x removed, the daughter of another full sibling of Stelios and Maria, Angeline Chardoulias Karr (1896-1984). The back of this photos was labeled 1939 and had an inscription written in Greek. Translated, it said: "To the family of my Uncle Karantzis (Karr). From your niece, Paraskevi." This was Paraskevi sending a photo to her Aunt Angeline and family who were living in the United States in 1939. Paraskevi's family remained in Greece for their entire lives. I had a few questions about this photograph and Paraskevi's life. What sort of uniform was she wearing? Was it school related? Military? Did she have any siblings (I didn't think so, but I wasn't sure)? How and when did she die? I have no hard documentation that she died in 1945, but that information was passed to me by someone (perhaps by someone else) who presumably knew. "I think it was the uniform of a youth movement in the years 1936-'40. Its Greek initials were EON ( = National Youth Organisation). It was more or less obligatory to join." "EON stands for "Ethniki organosi neoleas". A youth organization set up in 1936- 1941 during the Metaxa regime. In '41 when the Germans invaded Greece the group was dissolved. It was for the productive spending of their free time Membership was open only to Christians." You can look here for some more information about the National Youth Organization of Greece. If you are feeling linguistically ambitious you can go to "Εθνική Οργάνωσις Νεολαίας". Written completely in Greek, it looks like a wonderful history of the organization (with many other photos included). There is a very helpful member of the Hellenic Genealogy Geek Facebook group who was able to find Paraskevi's birth certificate for me. He has helped me on several of my other Greek genealogy searches. If you know what you are looking for, and know a little Greek, and can decipher sometimes 100+ year old Greek handwriting, you might be able to find information like this at the Greek General State Archives. Perhaps in a future post I will dissect the birth certificate and show you what each part of the document means. 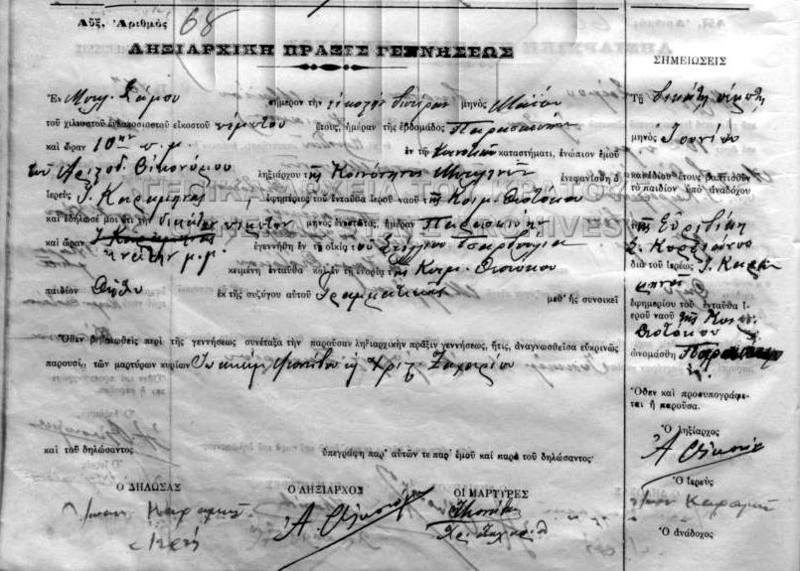 "Birth registration 68/1925 in Mytilinioi, Samos. Paraskevi was born on May 15 to Stellios Tsardoulias by his wife Grammatiki." In a follow up I asked him if there were any godparents listed on the document. He said that the godmother was listed as a Evridiki S. Kyrstianos. Though not a name I am at all familiar with from my research, that is a great detail to have. As I think about Paraskevi and my family tree I am reminded of the mission of The Psychologenealogist: Exploring the spaces where psychology, genealogy, and history converge - one story at a time. Here are some of the questions I have about. What is known about Paraskevi's mother, identified as Grammatiki? Who was Evridiki S. Kyrstianos? How did Paraskevi die? Where can I find a death certificate? Did Stelios or Paraskevi ever visit the United States? Embarrassingly, I know very little about the politics and history of Greece, especially right before World War II when this photo was taken. 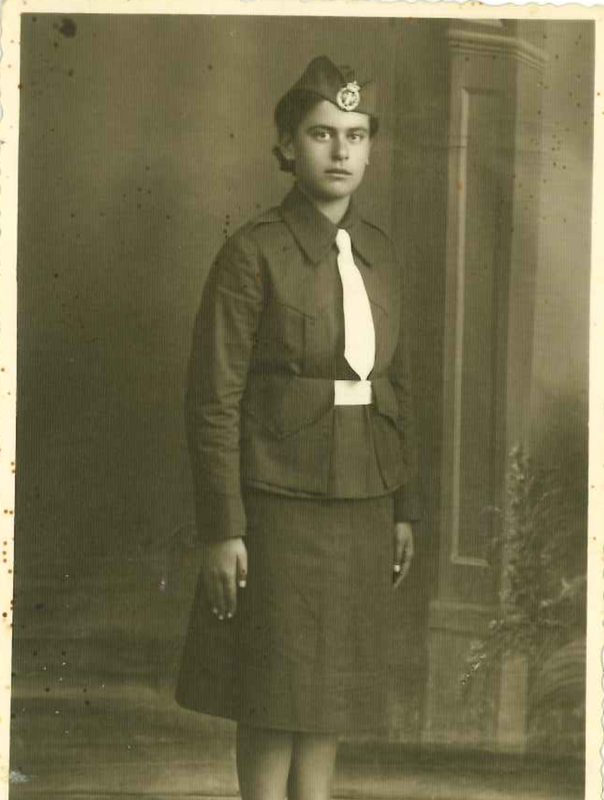 What was it like for Paraskevi and other teenagers living in Greece on the eve of WWII? What role did youth organizations like the E.O.N. play in the development and psychology of those who were members? It appears that Stelios lived at least another 40 years after the death of his daughter, presumably his only child. What was his life like without her? This is the 12th of 52 weekly posts planned for 2018. It was inspired by the #52Ancestors writing challenge issued by professional genealogist, Amy Crow Johnson. The challenge: once a week, for all 52 weeks of the year, write about a relative in your family tree.